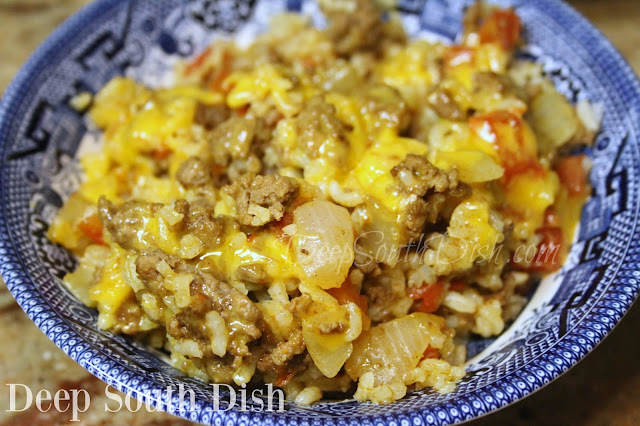 A quick beef and rice skillet with a little Southwestern flair from sweet and hot peppers, chili powder, cumin and paprika, diced tomatoes with green chilies and Mexican blend cheeses. Eat as is, or roll up in flour or corn tortillas and top with a dollop of salsa, guacamole and sour cream. I love a good skillet meal! They're easy and certainly quick and because of that they don't heat up the kitchen too much, an important bonus in these triple digit summers we're having in the south. I actually cut this recipe off of a package of Kraft shredded cheese sometime back and finally got around to giving it a try. I found it to be a bit bland sounding though, and it also appeared to be lacking in some of the typical flavor elements you might find in a dish labeled as "southwestern," so I used it as a base, and made some changes by adding more veggies, spices and seasonings. "Southwestern food is a fusion cuisine, combining rancher staples (i.e. 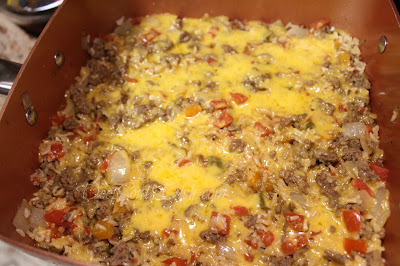 beef and cheese) with spices and produce native to the Americas like chili peppers, corn, and tomatoes. It's rustic, hearty comfort food at its spiciest." 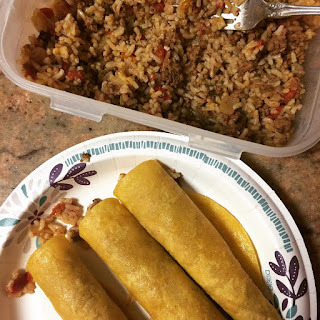 Despite the fact that I was really just looking for something easy for a quick meal, this turned out really good, and it's a filling meal that you can get on the table pretty quick. I stuffed some of the leftovers into softened corn tortillas and had that for breakfast one morning. Eat as is with a nice garden salad on the side, or roll up in flour or corn tortillas and top with a dollop of salsa, guacamole and sour cream for a great meal! Heat oil in skillet; add onion and peppers and cook until tender, about 4 minutes. Add garlic and cook another minute. Add beef and brown; drain off fat. Add seasonings, broth and tomatoes and bring to a boil. Stir in corn and rice, cover, reduce heat to a low simmer and cook for 10 minutes or until rice is tender. Top with cheese, remove from heat, cover and allow cheese to melt before serving. Eat as is with a nice garden salad on the side, or roll up in flour or corn tortillas and top with a dollop of salsa, guacamole and sour cream for a great meal! Cook's Notes: 1 pound boneless, skinless chicken breasts, cut into chunks and chicken broth may be substituted. Substitute mild Rotel, or plain diced tomatoes if you prefer less heat. Tip: Use this as a filling for stuffed peppers. Prepare a sauce of 1/4 cup each of chopped onion, celery and bell pepper, sauteed in 1 tablespoon of butter. Stir in 2 (8 ounce) cans of regular tomato sauce and let simmer for 15 minutes. Trim peppers for stuffing and parboil for 5 minutes to soften. Add 1/2 cup of the sauce to the prepared beef skillet and stuff peppers, placing into a casserole dish with 1/2 cup water in the bottom. Spoon remaining sauce evenly over the top of peppers. Bake in preheated 350 degrees F oven for 30 to 40 minutes, or until peppers are tender and filling is heated through. Top with cheese and return to oven just until melted.